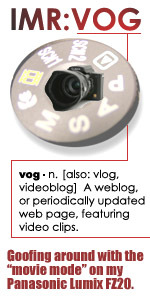 To some geeks, vog is short for video blog. To most people in Hawaii, it's shorthand for volcanic fog, which descends upon the islands when Madam Pele is having a particularly bad day. To me, I guess it's both. HawaiiVog is my vlog, my vodcast, my vidcast, or (if you must) video podcast. Whatever you call it, please enjoy it! I journal and blog and moblog and recently started a podcast, so this is my tentative foray into the third dimension of video. Taking the family to Waimanalo Beach, one of our favorite stretches of shore on the island. Waimanalo Beach from hawaii on Vimeo. The above is the embedded video player from Vimeo, one of the few online video hosts to serve up HD content. To see the HD video (and not a scaled and compressed Flash version), however, you need to view it at Vimeo or download the original movie file (1280x720/MP4). It should look great on an Apple TV. You can also watch this video via low quality but fast loading Flash players at YouTube, Yahoo! Video, Viddler, and downloaded from the Internet Archive. Subscribe to the HawaiiVog video podcast via iTunes, or in the media aggregator of your choice via RSS. A quick tour of Honolulu for Flat Stanley, visiting from Mrs. Shalowitz's First Grade Class at Pearson's Corner Elementary School in Mechanicsville, Virginia. Flat Stanley in Hawaii from hawaii on Vimeo. You can also watch this video via low quality but fast loading Flash players at YouTube, Yahoo! Video, Viddler, and Blip TV. And several versions of this video (including high-definition MPEG-4 and DivX) can be downloaded from the Internet Archive. Bringing my kids -- Katie (11), Zac (6) and Alex (4) -- to visit my dad in Aina Haina. My first iMovie '09 project, taking clips from a Sanyo Xacti HD700 and exporting via QuickTime via custom HD settings. Visiting Grandpa from hawaii on Vimeo. The first Flickr Friday lunch meetup of 2009 was held on the grounds of Iolani Palace. Two dozen local photographers gathered to talkstory, trade tips, and take pictures. Flickr Friday - January 2009 (FlipMino HD) from hawaii on Vimeo. I took video clips with my Flip MinoHD camera, and decided to also edit it entirely using the FlipShare software that comes with it. (I use a Mac, and would usually use Final Cut Express or iMovie.) It's not something I'm likely to repeat. The FlipShare software is very rudimentary, and best for connecting a few clips, and definitely becomes unwieldy with 30 clips like the set I used for this movie. There's a basic clip editor to set start and endpoints, but it requires to to save over or save a copy in order to use the edited clip. Also, all you've got are dissolve transitions and two title slides - one at the beginning, and one on the end. There are a handful of music loops, and I used one for this movie. But even set to be 'quieter than the video audio,' it's pretty overpowering. The one upside to using FlipShare to something like Final Cut Express or iMovie is that FlipShare works natively with the video format, resolution, and bitrate of the Flip MinoHD's clips. So the final movie retains all of the quality of the original clips (such as it is). The above is the embedded video player from Vimeo, one of the few online video hosts to serve up HD content. To see the HD video (and not a scaled and compressed Flash version), however, you need to view it at Vimeo or download the original movie file (375MB/1280x720/MOV). It should look great on an Apple TV. PodCamp Hawaii - Day 2 from hawaii on Vimeo. The above is the embedded video player from Vimeo, one of the few online video hosts to serve up HD content. To see the HD video (and not a scaled and compressed Flash version), however, you need to view it at Vimeo or download the original movie file (199MB/1280x720/MP4). It should look great on an Apple TV. You can also watch this video via low quality but fast loading Flash players at YouTube, Google Video, Yahoo! Video, Viddler, and Blip TV. And several versions of this video (including high-definition MPEG-4 and DivX) can be downloaded from the Internet Archive. © 1997-2005 Ryan Kawailani Ozawa · E-Mail: imr@lightfantastic.org · Created: 12 April 2005 · Last Modified: "